Are you going on a trip any time soon? If yes, please tell me that we're in the same boat, and that planning for a trip makes you feel like you need to buy all new things. I don't know what the deal is, but every time I start planning a trip I start thinking that I obviously need a whole new wardrobe to bring with me. Right now we're planning a trip to Southeast Asia at the end of March, and I've basically been shopping non-stop. 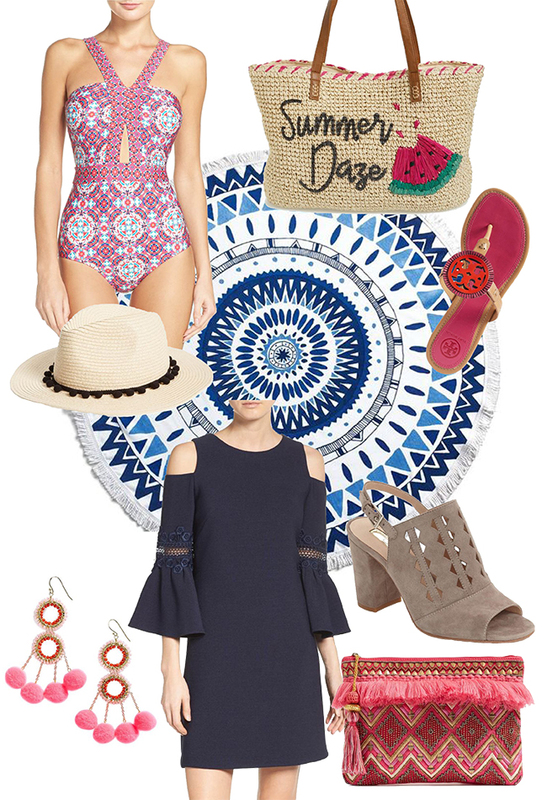 And, because this particular trip is going to involve a lot of beaches and pools, a lot of the shopping has been for bright and fun pieces - because if you can't wear neon pom-poms at the beach, then when can you wear them?! I've already added a couple of items to my closet, including this off-the-shoulder dress, these pom-pom earrings, this tote, and the white Lily Pulitzer dress I snagged during the after party sale. I'm hoping to snag a few more things to bring with me though, including some new sandals (because I usually can't handle even looking at my sandals from the year before - gross!) and a few tops with some fun details. But because I'm bad at sticking to the plan of shopping only what I *need* I'll also probably add another new dress or two too - there are just so many cute options out there right now! !